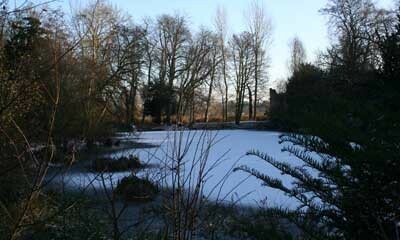 The frozen pond in the Palace grounds near to the hauling lane where ghostly figures once terrified the villagers. Everyone loves a ghost story, especially told in the dark winter months – and our ancestors were no exception. Apparently, through the centuries, many tales were told concerning a number of ghostly figures that once haunted this very locality and chilled the heart of every villager who stepped out at night. In the 1890s, a local historian, one Mr. William Camidge – and let it be said, a respectable citizen of York – spent much time talking to residents of the city and surrounding villages. He wrote up his findings as articles for the Yorkshire Gazette and eventually published a collection in a small book entitled, Ouse Bridge to Naburn Lock. Mr. Camidge found that ghosts and their wanderings were part of the local folklore of York and beyond. His attitude was one of scepticism and he treated such stories as nothing more than pure fiction. Despite this, he thought it worth devoting a whole chapter to the spectres that reputedly walked the area around Middlethorpe. Take them or leave them – this is what he learned. Long years ago, on the hauling lane [tow path] that runs along the river down to Middlethorpe, a lady without a head walked every dark night, to the dismay and terror of many people. She was invariably clothed in white and the tale told of her death gave effect to her appearance. It was asserted that the woman walked by the river one summer night and, coming to the hauling lane where a clump of trees had braved the storms of centuries, she was cruelly murdered by decapitation. In death, bent on pursuing her murderers, she came forth at the witching hours of night, just as the boom of the Minster clock broke upon the still hour of midnight. Headless, but wrapped in a shroud, she wandered to and fro along the river bank and, when wearied with her fruitless toil, she returned to her dusty bed. Every inhabitant of Middlethorpe and Bishopthorpe could, many years ago, tell of seeing her, and describe her walk, her waiting, and her headless form. The most veritable ghost was the one supposed to be that of Archbishop Scrope, who walked the road to conduct his own funeral procession. The Archbishop, it will be remembered, was tried in 1405 at the Palace, under the instruction of Henry IV. Found guilty of treason, he rode to his execution which took place in a field near Clementhorpe just outside the city. The most persistent story told of his ghostly appearance was related by a man who made his living as a slaughterman, and by doing odd jobs for the butchers of the city. This Robert Johnson, accompanied by an apprentice, was sent to a farm beyond Bishopthorpe to fetch some sheep. As they returned in the darkness, nearing the hauling lane, each suddenly saw a coffin suspended in the air and moving slowly along in the direction of York. It tilted occasionally, as if borne on the shoulders of men who were thrown out of step by the rugged character of the roadway. The coffin was covered with a heavy black pall of velvet, fringed with white silk. Behind it, with measured tread, walked a bishop dressed in fine linen, bearing in his hands a large open book, over which his head was bent; but from his lips, no sound came. On went the procession, with the steady precision observed in bearing the dead to the grave. While the men’s sheep kept pace, they would not be driven past the strange sight. Both man and boy felt as if the power of speech had left them; for the moment, both were paralysed. Perspiration poured from them so that they bore the appearance of having been in the river. They felt as if the atmosphere was so heavy that it would not permit them to breathe. The spectral procession continued to move at a leisured pace till it came to the field where the Archbishop was beheaded. There the vision disappeared. Robert Johnson and the apprentice made their way home in silence and were put to bed in a state of shock where they remained for several days. When sufficiently restored, their story was repeated with particular detail and gained universal credence from the fact that many villagers and citizens had experienced like sight and sensation. The boy forsook his business and went to sea, lest he be compelled to take a similar journey, whilst the man ever after avoided that road at nightfall, but never swerved from declaring his story true. The chronicler, Mr. William Camidge, was quietly confident that this explanation not only got rid of this ghost very satisfactorily, but also provided a similar hypothesis for almost every spectre in the country. Who can tell? Once the sun goes down, walking the dark lanes of Bishopthorpe and Middlethorpe will never be quite the same again. Sleep well! 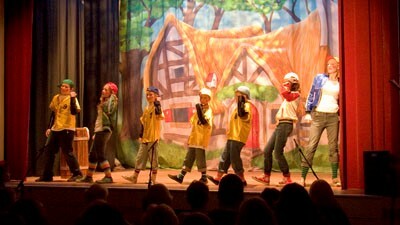 The latest Ebor Players pantomime Snow White opened last night to a rousing response from the mixed audience. 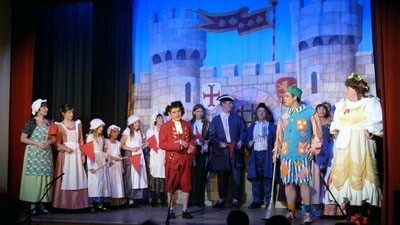 Amateur dramatics this may be, but right from the start this was a production that was as professional as could be. Local audiences have come to expect strong performances from the lead actors, and tonight was no exception. The Dame (David Rose) bustled his way to centre stage and took command of the audience, but not before the opening ensemble music and dance routine demonstrated that the cast were out to enjoy themselves too. Throughout the production the Dame carried along the story – or lack of it – with gusto, ad-libbing her way on and off the stage with aplomb. A solid music hall comic duo with her foil Simple Simon (Tom Davis) developed, to the delight of the audience young and old, as jokes and one-liners whizzed around the newly named Massie Hall. 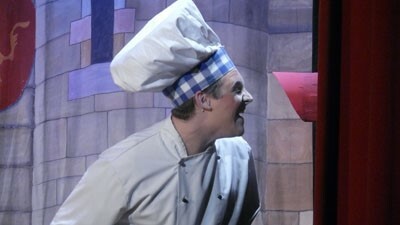 Their slapstick kitchen scene was well contrived with a well sustained radio gag, and even the props behaved themselves! As last year the Principal Boy Prince Florian (Bobbie Parrish-Moreton) and Principal Girl Snow White (Georgina Sykes) handled their song and dance routines together really well, and the bad, the very bad, Queen Catrina (Philippa Parish) sulked, pouted and was convincingly vain. The third pairing that took the eye was that of Reggie Rank (Lisa Thornton) and Phineas File (Tracey Patrick), a couple of unlikely lads with strange accents and a tendency to bling it. They obviously enjoyed their parts and could yet challenge the comic leads for audience appreciation. There are two choruses to the production, and the senior one came on and did their bit and even got some lines of their own – well done all. The junior chorus this year had seven new youngsters from the age of seven, and they were very impressive with their confidence from the outset. Their delightful performances, particularly at the beginning of Act 2, got a rousing audience response. There will be some proud families in Bish this week! Oh, and the dwarfs? They took a while to appear, but did so with fun in their approach and they looked right too. Hi ho silver mining was a great song for them. The minor parts too came on and provided the threads to keep the story going. In fact the music throughout was exemplary, with a blend of new and older songs, and some very good snippets of classical themes that set the tone well as scenes started. 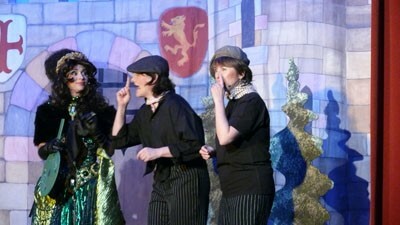 With even better costumes supplied by Dress Circle in Haxby, excellent scenery, and good lighting and sound effects, the production values were far in advance of what might be expected in a village hall. This was a first night outing with an audience, and although the action cracked along at a fair pace this will probably adapt to audience reaction, and introduce a bit more light and shade into the plot. Towards the end, the sinister apple and its outcome seemed a bit light and a bit rushed. Tim Bruce as Director and Chris Higgins as Choreographer are once more to be congratulated on staging such a bold production in limited surroundings. If you have a ticket and can’t go, I suggest you would get a very good price on Ebay for it as anyone would be foolish to give this panto a miss.